The silent demonisation is striking in many states as ATMs runs dry making people remembering cash crunch during the note ban on 8 November 2016. Many people across the country are facing a shortage of cash from last 15 days as the ATMs are not dispensing currency notes. “We are facing a cash crunch. ATMs are not dispensing cash. The situation has been the same for 15 days. We have visited several ATMs today as well, to no avail,” the agency quoted people as saying. In Hyderabad, news agency ANI quoted people as saying they had been unable to withdraw cash since yesterday. There are similar reports from Varanasi. Meanwhile, Finance Minister Arun Jaitley calls it a temporary shortage and said, "overall there is more than the adequate currency in circulation...the temporary shortage is caused by a sudden and unusual increase in some areas." Well, whenever government give chances to the people they without giving a thought and slams their act of government failure. No doubt Twitterati are creative and funny both at a time and knows well to take a dig over the issues in a unique style. Just, the news of Cashless ATMs made rows on media, twitterati came on the filed with their creative heads that are their big weapons. 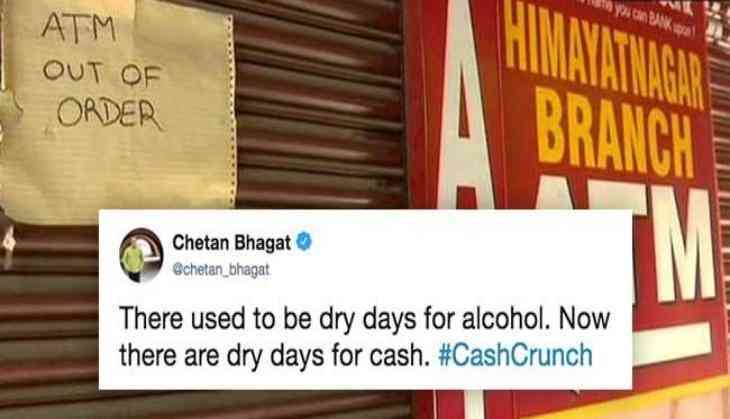 Check the tweet here, how tweeple started a #CashCrunch rebellion. Acche Din #CashCrunch is Bura Waqt for BJP? These are Good times for Common People? Create 1 crore jobs every year. Bring back Swiss black money.